For the sixth consecutive year, Blancpain presents a limited-edition wristwatch equipped with the Traditional Chinese Calendar in tribute to this age-old culture. A horological complication exclusively developed by the Manufacture in Le Brassus, the Traditional Chinese Calendar is housed in a platinum case, while the movement’s oscillating weight is engraved with the symbol of the current lunar year. In 2018, the sign of the dog is thus highlighted on the back of this model. 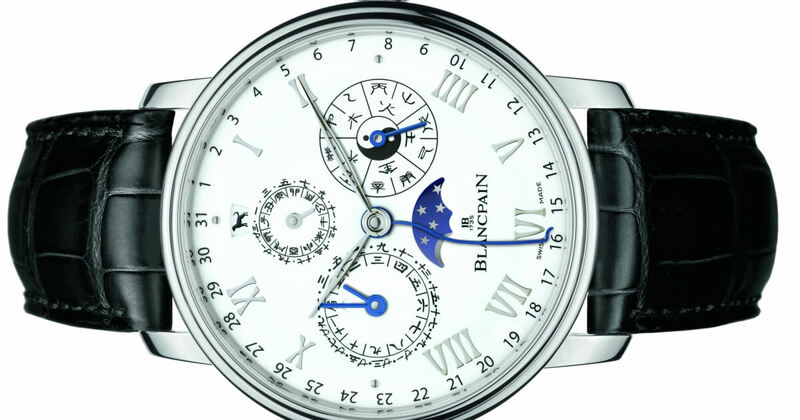 The Traditional Chinese Calendar watch by Blancpain is based on fundamental principles established for millennia and profoundly rooted in Chinese tradition. On its fascinating dial, the hours, minutes and the Gregorian calendar rub shoulders with the main indications of the Chinese calendar: traditional double-hour indication, day, month with indication of leap months, signs of the zodiac, as well as the five elements and the 10 celestial stems. The combination of the latter with the 12 animals of the zodiac that represent the terrestrial branches follows the sixty-year cycle that is central to Chinese culture. The moon phases, a key element in Blancpain complete calendars, are also presented and play a particularly important role in this model, given the link between the lunar cycle and traditional Chinese months. Contrary to the Gregorian solar calendar which uses the solar day as the base unit, the traditional Chinese calendar is a lunisolar calendar, meaning a solar calendar with the lunar cycle (29.53059 days) as its base unit. Since a year comprising 12 lunar months (354.36707 days) is approximately 11 days too short compared with the tropical or solar year (365.242374 days), a leap month is sometimes added to preserve the match with the cycle of the seasons. Given that each month of the Chinese calendar, including the leap months, begins on the day of the new moon, its length is either 29 or 30 days. This means that when a year comprises a leap month, this 13-month year will be longer than the tropical year. On the contrary, when there is no leap month, the year of 12 lunar months is shorter than the tropical year. This distinctive feature is the reason behind the variable date of the Chinese New Year. The self-winding caliber 3638 powering this watch is endowed with a 7-day power reserve, despite the presence of 464 parts including 36 jewels. Its complexity stems as much from the number of indications to be displayed as from the irregular nature of their cycles. The hours, minutes and the Gregorian calendar are presented in the center. The counter at 12 o’clock indicates the double-hour numerals and symbols (24-hour cycle); while the one at 3 o’clock shows the elements and the celestial stems (10-year cycle). The month of the Chinese calendar (12-month cycle), its date (30-day cycle) and the leap month indicator appear at 9 o’clock, while the 12 o’clock aperture reveals the zodiac sign of the year in progress (12-year cycle) – corresponding to the dog in 2018. Meanwhile, the moon phases are displayed at 6 o’clock. 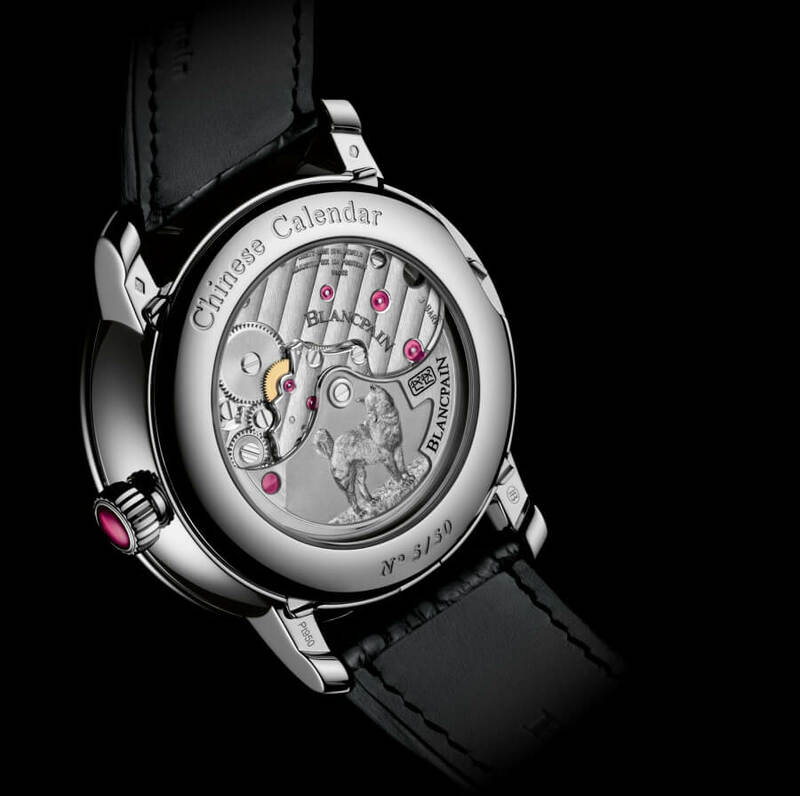 The 45 mm-diameter platinum case is fitted with a crown adorned with a cabochon-cut ruby and comprises five integrated under-lug correctors serving to adjust the indications. 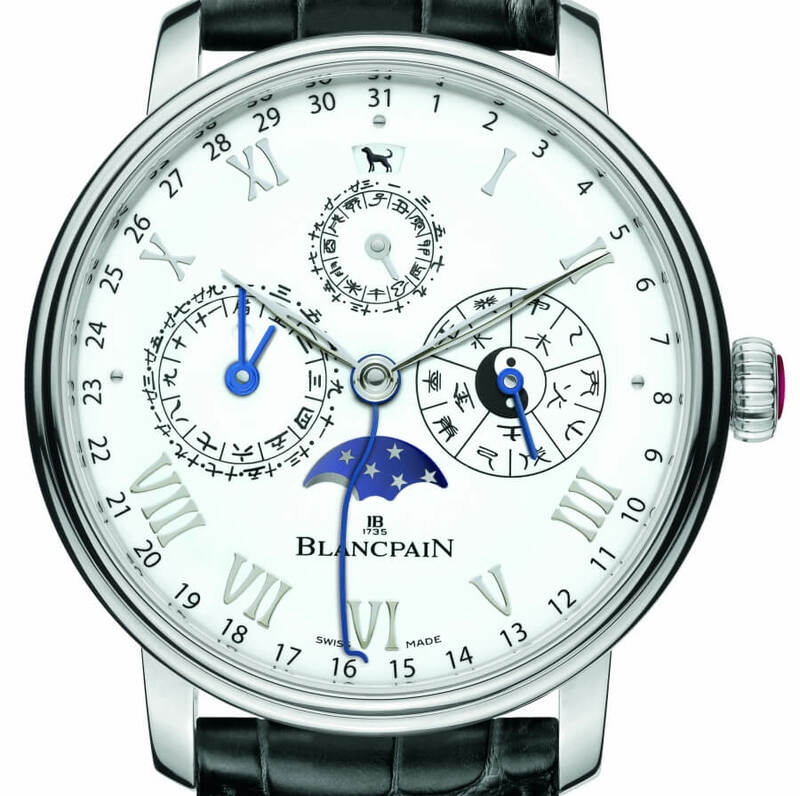 It features the classic signature attributes of the Villeret collection: its double-stepped shape; a grand feu enamel dial with a chapter ring composed of gold appliques, and indications transferred before the firing process, the main hands shaped like slightly hollowed leaves; and the blued steel Gregorian date pointer appearing in the traditional serpentine form. This 50-piece limited-edition watch is equipped with a white gold oscillating weight, engraved with a dog. The Traditional Chinese Calendar model is also available in a non-limited version with a red gold case. Treaditional Chinese Calendar (double-hour indication, signs of zodiac, date and month of the Chinese calendar. Indication of the five elements, the celestial stems and the leap months); Gregorian calendar; moon phases; under-lug correctors; secured movement; white grand feu enamel dial; oscillating weight set with a Madagascar ruby; self-winding. Platinum, oscillating weight and crown set with a Madagascar ruby. 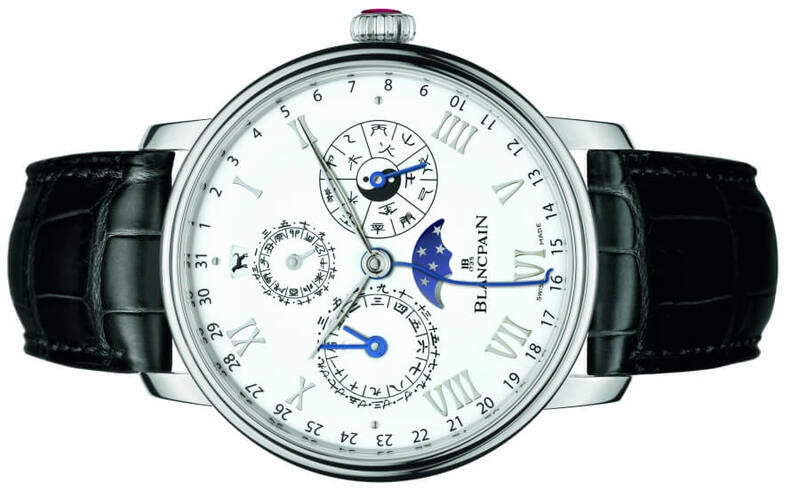 For more visit Blancpain Online.